Dubai: Do you want to get on a Dubai Metro ride through a galaxy of stars or take a swing of imagination amidst a sea of clouds? Or are you more interested in joining an astronaut to climb up a ladder into the sky? A series of murals on the Dubai Metro bridge along Shaikh Zayed Road will let you give your imagination bit of a flight. Depicting the spirit of innovation and freedom of thought, the murals are part of an initiative that aims to transform Dubai into an open-air museum, celebrate art, creativity and aesthetic excellence. 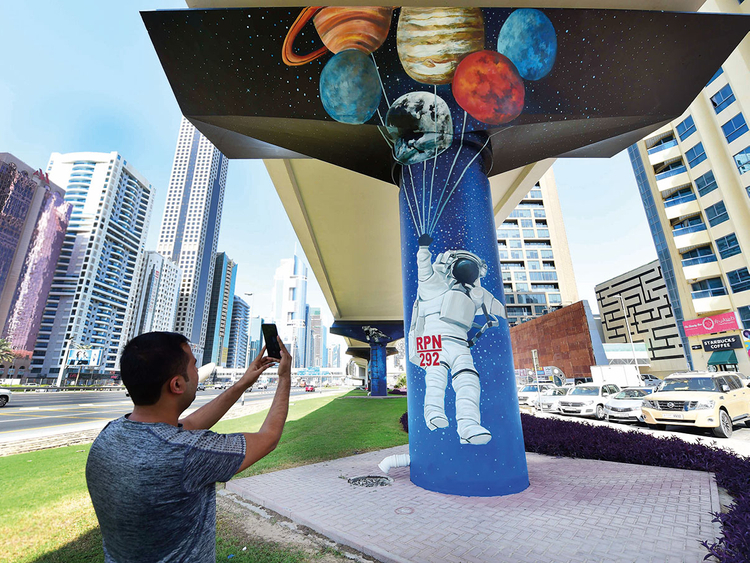 Under the project, three international artists, Peruvian Daniel Cortez and Dominican-born Miami-based artist ‘Evoca1’ also known as Elio Mercado and Ukrainian Yevgen Trofymchuk have painted murals on the pillars of the Dubai Metro bridge on Shaikh Zayed Road between the Dubai International Financial Centre and Emirates Towers stations. According to Nehal Badri, Director of Brand Dubai, which is carrying out the project in cooperation with the Roads and Transport Authority (RTA), the themes of the murals have been chosen to inspire creativity and spread happiness while also reflecting Dubai’s character, vision and future aspirations. One of the artworks shows an astronaut hanging from the strings attached to a bunch of planets, ready to land back on earth. The bunch of planets also seem like a hot air balloon. The mural is an obvious reflection of the UAE’s declared ambition of landing in Mars. Another pillar has a man travelling on a hot air balloon made of flowers, with the riders looking through a telescope into the horizon, reflecting UAE’s eye on the future. Completed on November 10, the 10 murals were painted in 13 days starting on October 28. Speaking to Gulf News as he gave the finishing touches to his work, Peruvian artist Daniel Cortez said that the murals depict creative thinking and imagination. From the skies the mural move to the water world where dolphins are flying with birds, while aquatic organisms like jelly fish swim among the stars. As part of the Dubai Street Museum initiative that aims to enhance the aesthetic appeal of the city, the project will bring art closer to the community. “Murals envisioned through the project will add further elegance to the image of the city, especially in densely populated areas and tourist attractions. Eventually, it will bring an added value to the community, and boost the happiness of Dubai residents and visitors. Dubai Metro will be a key element in delivering the project as it has a symbolic reference to the advancement of Dubai,” said Moaza Al Merri, Director of Marketing and Corporate Communication at RTA. She added that the RTA in cooperation with Brand Dubai, will implement a series of similar projects that will make public spaces more appealing and create a distinct visual identity fostering a sense of belonging and pride within the community. Echoing Moaza, Badri said that the murals support Dubai’s vision of transforming itself into an ‘open-air museum’. “This project contributes towards infusing creative vitality into Dubai’s urban environment to further enhance its status as one of the world’s most cosmopolitan and diverse cities,” Badri added. The Dubai Metro Murals project is the third phase of the Dubai Street Museum. The first two phases focused on creating murals on the 2nd December Street and the Hatta Dam respectively.